Watching the leaves change colors has to be one of my favorite fall events. 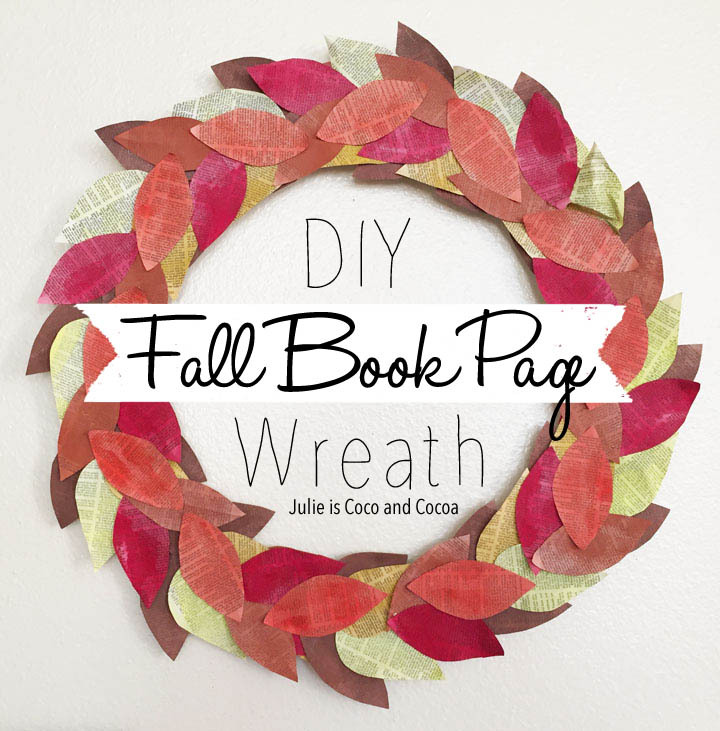 Bring those autumn colors indoors, or to your front door, with a Fall Book Page Wreath. Jumping into a pile of leaves is pretty fun. Having to rake up the leaves isn’t as much fun. The trees in our neighborhood are primary pine trees and oak trees. Neither of which have pretty fall colors. Though I do have a pretty enormous collection of pine cones that I get to craft with. But I love the color of fall leaves and I wanted those colors on display. 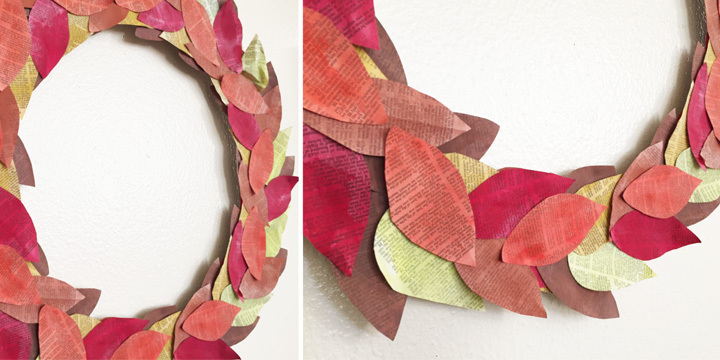 So I made my own fall leaves and turned them into a wreath. As an avid reader I have plenty of books at my house. But none that I was willing to tear up for a project. Instead I went to a local dollar store and found the largest paperbook that they had for one dollar. The thrift store would also be a great place to pick up a used book for this project. Mix your watercolor paint with water to get the consistency and transparency that you desire. I went a little darker with most of my colors. 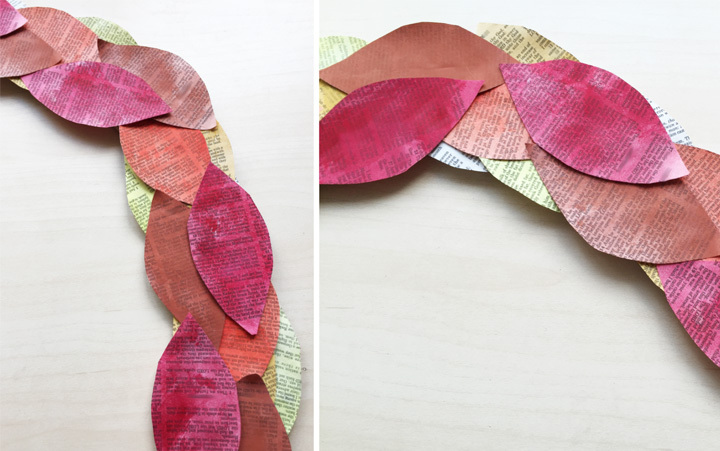 I found using a paintbrush and a sponge to be the best way to paint my book pages. 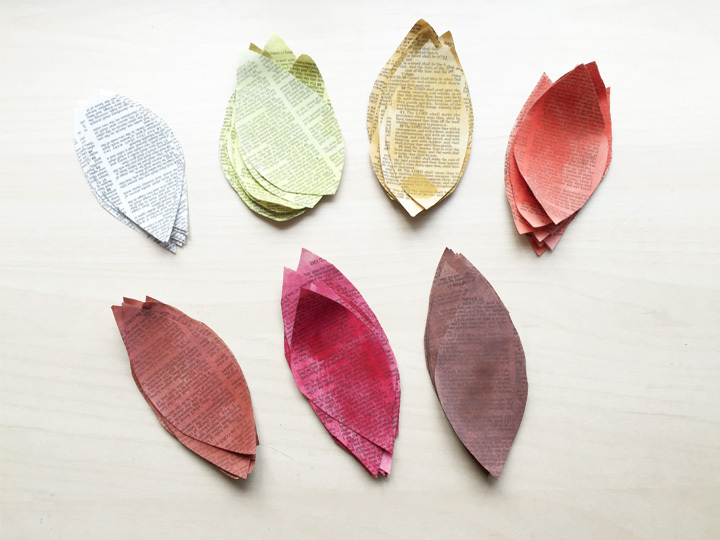 After allowing the painted book pages to dry I folded each page in half twice to create a rectangle four layers thick. Then I cut out a leaf sheet from each folded paper. Then it is time to start applying the leaves to the wreath base. I divided each colored stack in half. One color at a time I added the half stack of leaves to my wreath base, attaching the leaves with hot glue. This was a great way to make sure that the wreath base itself was completely covered by the leaves. Then I added the other half of my book page leaves. Knowing these would be the ones most visible I took my time and laid out a pattern for the leaves before I started gluing them down. Once I had them placed where I wanted I hot glued them in place. 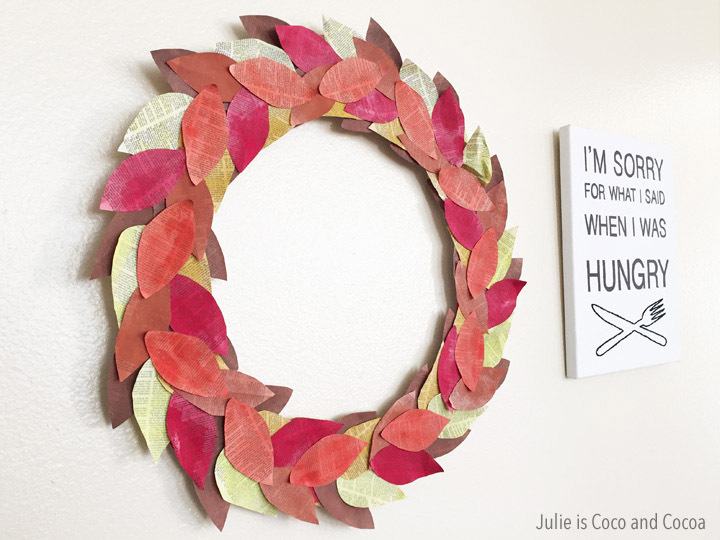 Bring in more fall sights by adding some acorns to your wreath. Or attach some cranberries to give it a Thanksgiving touch. Enjoy the autumn colors hanging on your wall for the entire season!